In this paper, we have studied the problem of completeness of relational query languages. We have etablished a criterion for completeness. A query language was proved to be complete. 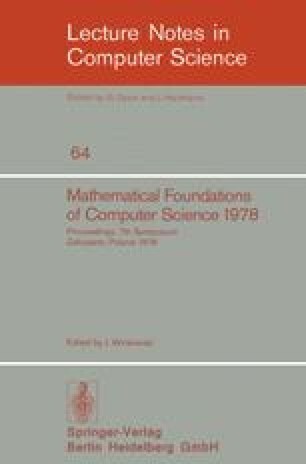 Since this language is the one used as a standard for completeness this results gives strong theoretical basis to Codd's definition of completeness. There are however some limitations to this notion of completeness : for instance there is no first order formula describing the transitive closure r* of a binary relation r ! While this seems at first to be in contradiction with theorem 2, one should recall that the notion of completeness we have introduced is static. Therefore, for any configuration τ consisting of a binary relation r there exists a formula rτ of the first order calculus describing the transitive closure of r, but this formula depends on τ and there is no formula describing the mapping which associates with a binary relation its transitive closure.